One of the most prominent saffron-clad Sri Lankan emissaries, Most Ven Prof. Bellanwila Wimalaratana Nayake Thera who brightened the seat of monkhood, socio-religious harmony and reconciliation in our times, having championed the crusade against stinking politics and its hegemonic impact on us, is no more. His sudden demise at a time his critical guidance is most needed to rid our body politics of its pollutants came as a scathing blow to all moderate and right-thinking segments of our society on the eve of our 70th Independence day, particularly after the passing-away of his university pal, Most Ven Maduluwawe Sobhitha Nayake Thera who had left an indelible mark among all of us. Memories of Ven Wimalaratana Thera, no doubt would linger on in for the rest of our lives in Bellanwila, because he was not only affiliated with Sangha fraternity alone, but also with the laity (Dayaka) who venerated him as an outspoken monk in our country. In one sense, he remained a strong supporter for our social justice and reforms, and in others, he was an author of many books, a role model for his Kotte Sangha Sabha members, an erudite scholar at academic levels, a straight forward voice for the voiceless, and not the least, as the most distinguished monk in the province. Bornin Bellanwila, just 76 years ago on a noteworthy day (April 14), he belonged to a well-known family lineage of ‘Omaththage’ in the area in a family of several brothers. It was the then incumbent, Most Ven Bellanwila Sri Somaratana Nayake Thera, highly respected as the pioneer of contemporary revival of the ancient Bellanwila Raja Maha Viharaya who ordained the present Viharadhipathi, Most Ven Bellanwila Dhammaratana Nayake Thera and also our protagonist in focus, late Ven Wimalaratana Thera as Ven Somaratana's novice monks (samanera) who followed basic Dhamma education in the Vidyalankara Pirivena and also afterwards university studies. A fact that remained very distinct in his varsity days of learning was his close association with the then socialist-leftist doctrine of the Philip Gunewardene's era, et al. He also, it is said, was instrumental in organising student protests inside the campus against different issues as young revolutionary monks of the times, an experience that would have perhaps carried him forward into his subsequent firebrand types of protests as he matured later on to be a full-pledged scholar and a social reformer. Upon the demise of his Guru, Ven Somaratana Thera in 1984, he was compelled to take reins as the Viharadhikari in this huge place of worship since Ven Dhammaratana Thera, his own elder brother, had by then migrated to Singapore on missionary work. Bellanwila temple was his forte afterwards. After receipt of his Doctorate (PhD) from the University of Lancaster in UK and his return, he was invited to the University of Sri Jayawardenapura for academic teaching. There, he rose to be the Dean of the Faculty of Buddhist and Pali Studies until his subsequent pre-retirement due to ever-increasing workload in the temple. He might be one of the most rare personages who had gradually reached the apex of office as the Chancellor in the very university where he served as a lecturer. Late Wimalaratana Thera as a scholar took to writing at first to university journals, magazines, newspapers, etc before he penned his own books of academic research and value. ‘Buddhism & other Religions’, ‘Evolution of Making Buddha Statues’, ‘Viharalipi Saraniya’, ‘Paramitha Sarana’, are among some of the most popular ones he authored. His Sinhala translation of the ‘Unshaken Mind’ (Noselena Manasa) was serialized in national newspapers and it grabbed the attention of many an intellectual and readers. “There is nothing amusing, like writing or authoring a book for me since it is my simple hobby. It is actually what I enjoy most as I grow older and older,” he once plainly quipped to this writer during an interactive meet at the temple many moons ago. He was so close to our hearts and just a few days before his untimely death, he was found giving final touches to his latest research book on a new theme. 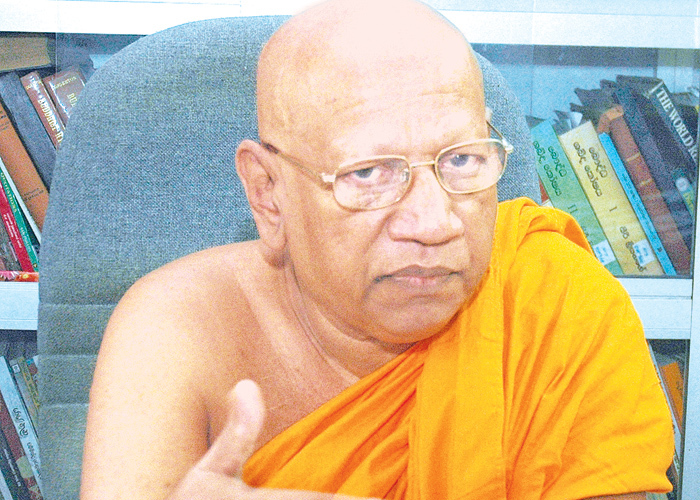 The tripartite combination of Ven Iththepane Dhammalankara Nayake Thera, Ven Maduluwawe Sobhitha Thera and Ven Wimalaratana Thera did not take long to emerge as dedicated guardians of the common-folk as the political scenario after 1995s began to take shape, apparently shifting towards a policy of appeasing separatists who were fighting for division of the country. The trio stood their ground firm, unmoved and opposed vehemently to those moves as it would be disastrous to the country, if any division were to take place as planned by some political authorities of the times. All appeals fell on deaf ears and finally street protests led by the trio, began to swell and rotated round the Parliament roundabout near Diyawannawa, flanked by thousands of protesting monks and patriotic civilians. Their leadership compelled the then government to shelve that plan of action and changed their discourse. Needless to highlight, Ven Wimalaratana Thera who had the gift of the gab and the ability to convey the repercussions of any such ill-conceived political move won the day. For him, any assembly of pre-determined decision-makers was only a public platform where diverse opinions were aired. Hence, late Thera was always invited to speak out his voice, may it be a meeting of monks, politicians or otherwise since he has had the distinguished quality of addressing the concerns of the full picture of the issue in hand. He was admired and respected for such forthrightness and honesty. Ven Thera received much respect for this attitude from all quarters of non-Buddhist dignitaries as well. Fearless Ven Wimalaratana Thera never stood for communal politics or got onto any such stage during his illustrious life, full of spirits. Nor did he play hosannas to anyone how much mighty he would be since he did not expect any personal favours from any person in question. Another outstanding feature in him was his very close association with religious chiefs of all denominations through the Congress of Religions which he co-chaired until his demise. He fully believed in reconciliation, co-existence and ethnic harmony and always distanced himself from passions of communal hatred and extreme ideologies, harboured by some of his own community, Maha Sangha and others. Though he at times was subjected to criticisms, he stuck to his guns and challenged his dissidents to prove otherwise, if possible. The presence of Rev Oswald Gomis, Bishop, Rev Kenneth Fernando, Kurukkal and Moulavis in the temple premises soon after the news of his unfortunate death took to wings, proved this touch amply. That was a fitting tribute to his celebrated name, Ven Wimalaratana Thera unbowed in the presence of any mighty person but was a friend of all strata of society. He always disassociated himself with those extremists, whether they were politically backed or otherwise. He asserted that unless people of all ethnicities would work together, we would never be able to take this country forward. With his death, there falls a huge vacuum among us to find any future replacement as such. Perhaps only a limited number of Sri Lankans are aware that the Bellanwila Raja MahaVihara has been at the forefront of launching many a diverse welfare projects. A symbolic charge of Rs 20 from each vehicle parking in the yard there, has so far rescued the lives of many patients by dishing out more than Rs 100 lakhs in the past two years. More than a hundred such appeals still reach the temple in search of financial help for medicine or surgery, a unique humanitarian project of exemplary nature. So, is the Community Development Centre at Bellanwila, managed by the temple in order to provide vocational training to school dropouts. It was one of such pioneering institutes in the country even before state patronage for this sphere came into this effect. Our late Ven Wimalaratana Thera had a great network of philanthropists and well-wishers who would always stand by him either during such projects or the organising of the Perahera or any other event in the temple. It is also pertinent to mention here that Ven Dhammaratana Nayake Thera in his capacity as the religious advisor at the Buddhist Library in Singapore always assisted Ven Wimalaratana Thera by way of providing much-needed raw materials to such projects. Likewise, the conduct of Sunday school, Elders’ daycare centre, Pilgrims’ rest, welfare shops, etc are all patronized by our late Thera, despite heavy expenditure being incurred. Another feature that impressed us was his ability to maintain undisturbed administration of such projects in a relaxed mood, although at times he was critical. Only a few perhaps know that he was a cricket fan and never wanted to miss a match, either here or abroad. He also possessed a deep knowledge about reputed cricketers and interacted with them whenever time permitted. His passion for music and aestheticism was no less and saw no bounds. He always wanted to assist musicians in whatever the way possible. One of the most felicitation ceremonies he attended was that of Mrs Sujatha Attanayake at Sri Lanka Foundation Institute, about which he later expressed his opinion with this writer in person at the temple. He was so attached to artistes and film producers that he offered all possible assistance to everyone who came to our protagonist. Had late Somaratana Thera been considered the pioneer of the modern revival, it was none other than late Wimalaratana Thera who carried the name of Bellanwila to international fame, and left a niche for itself in overseas chronicles. He widely travelled and won a recognition for himself as a preacher or an intellectual of Buddhist knowledge. At times, he enjoyed very much cracking jokes with whom he feels desirable to do so. And he was the tower of strength behind the annual Esala Perahera spectacle after the demise of Most Ven Sri Somaratana Thera. He used to spend a fortnight of sleepless nights during the Perahera season, but ensured everything worked well until the Diyakapana ceremony got underway. He was so close to this writer in many fronts, although our Thera seldom had enough free time to relax. His affinity with us in the village was a strong catalyst and he made the day so interesting whenever we all travel outside Colombo once a year to attend the commemorative alms-giving of our Nayake Thera. But in this year, it would be a devastating blow when all of us had to commemorate Him too at any given place, transferring merits. May his cycle of Sansara be short and let him be reborn among us during this procession of Paramithas. May you attain supreme bliss of Nirvana!